A few weeks ago we wrote about the Capella at Pedregal and mentioned the yachts that are available to members of this exclusive community at the tip of the Baja Peninsula. This is a unique combination of residence club and yacht fractional ownership. 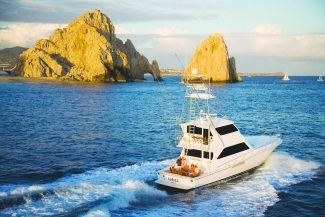 It sounds like most of the members of the Capella Pedregal residence club are also buying into the fractional yachts at the Capella Yacht Club in Cabo San Lucas. Each of the yachts boast three staterooms, a parlor, a salon complete with Sub-Zero refrigerator, state-of-the-art electronics, Satellite television and glossy teak finishes. The fleet's fishing yachts will come with tournament-grade fishing gear; cruising yachts, ideal for playful days at sea, will be stocked with top of the line scuba gear and trendsetting water toys, including a five-passenger Nouvarania sport boat and sea kayaks. There will be up to nine yachts in total when the community opens in Spring 2008, Capella has just added the Carina, its second yacht to the fleet, a sleek, 57-foot Viking sport cruiser, with boat slips at the adjacent Cabo Marina. Each yacht also has a professional captain and crew who have expert knowledge of local waters. Members may request single day yacht use, multi-day yacht use and even request more than one yacht at a time. On the multi day cruises there are many islands to explore and the club will arrange an onboard chef and nature guide to heighten the experience. Every October, Cabo San Lucas becomes the competitive sport fishing capital of the world, hosting the Bisbee Tournament. In 2006 the competition paid out over $4.1 million in prize money. During this time every year, the Capella Yacht Club will create member teams of four or more owners per yacht. Yacht Club Membership costs $75,000 with annual dues of approximately $5,500 and members can use the yachts whenever they are in residence at the club. Other thoughts for exciting things to do in summer include the adventures arranged at Cabo tours. See the listings for other private residence clubs around Mexico and in Cabo San Lucas. Here is information on other fractional yacht programs around the world.